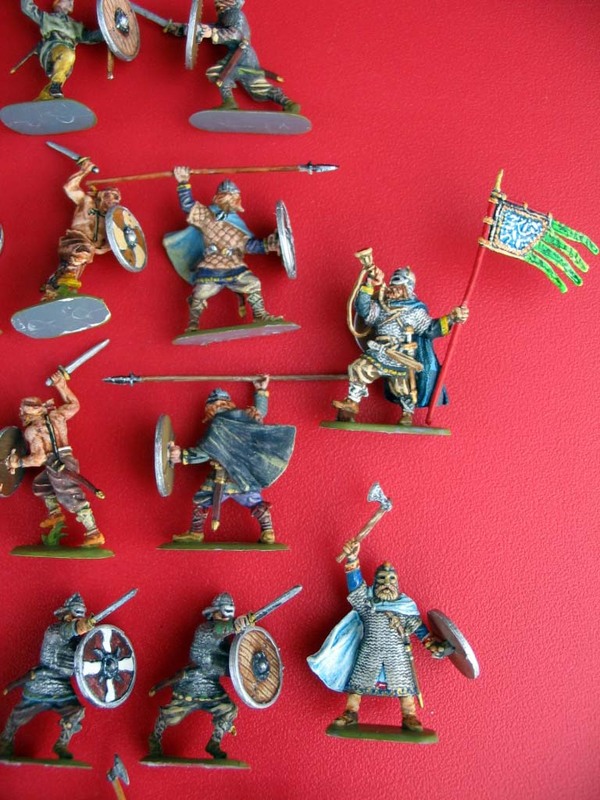 Today we review some epic miniatures, the Vikings. A very good and correct artwork, showing the real poses made in the same set. The box art is good, but the figures inside are even better. On the back we can see the painted soldiers (excellently, not like Mars, which is to show how not to paint them) and a brief description. Usual Zvezda set; detail a bit diffuse everywhere, without very sharp detail, but perfectly (and when I say perfectly, is perfectly) made proportions, lifelike poses (not the plain pseudo-egyptian poses we get in HaT and similar), and absolutely no flash at all. All the shields are given separate, which gives a very nice detail to figures. We have a perfect historical accuracy here. Maybe we should have more axemen, the chief could wear a more special and ornamented helmet and shield (horned helmets are now regarded as unhistorical by modern historians, but for those we have seen hundreds of films and other representations, to see a full set of Vikings without any horns seems strange). 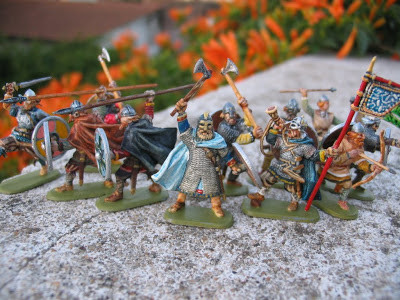 Another thing is that these Vikings seem Swedish Vikings of the east, the ones that confronted the Slavs, mainly for the archer with that hat and a bit for the standard bearer, but is nice to see an approach not so directed to fight in 1066 at Stamford Bridge like other sets. Two or three could be used for any Dark Age barbarian/germanic faction (the skirmisher could be used as a Goth of the 3rd century to a light Medieval troop), many also could be used for Medieval kingdoms of the north like the Denmark, Norway or Sweden, or early Russian kingdoms. Finally, some could be used as early Angles, Saxons, Frisians or Jutes. "I feel that many reviews are oblivious to this point - there are fantastic figures, which you can´t say anything against, but they are just too "correct", maybe too static, and so just boring. 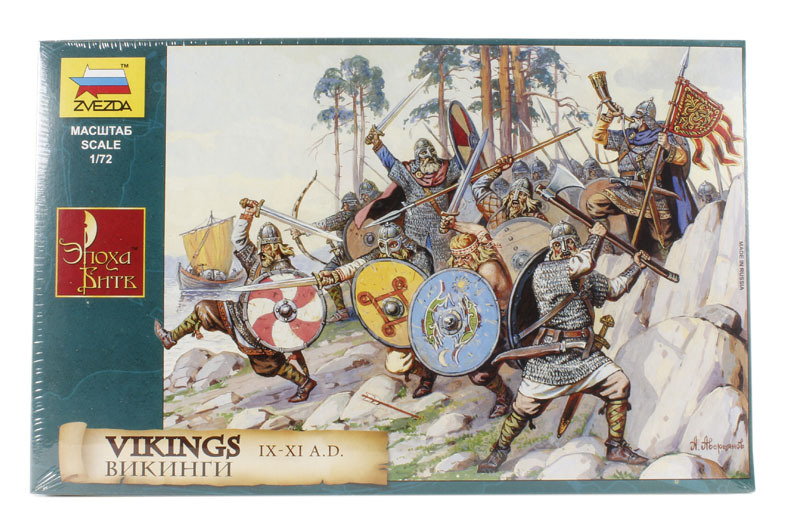 So I feel that this is an important point when deciding if you buy this set"
Vikings are always a fun theme. 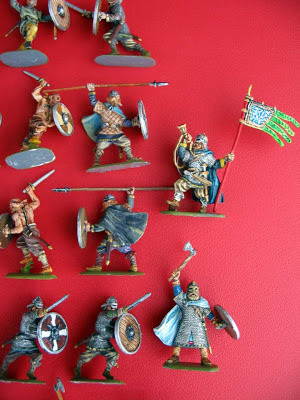 Maybe this are very historical, wargaming-adapted and correct Vikings, which makes them not so fun, but nevertheless we have besides the unique leader and standard bearer, a nice Berserker biting his shield, and the very interesting figure kicking a enemy, literally a figure I've never seen before, but you can be sure that Vikings bited, kicked and punched, any sort of way to defeat their enemies. You could say that this set is more really like a Viking Army, like those of the late Viking age, and not so much an adventurer gang of wild Vikings like those of the early Dark Ages. Zvezda is a wargaming-concerned company, and this set gives everything a wargamer might need. 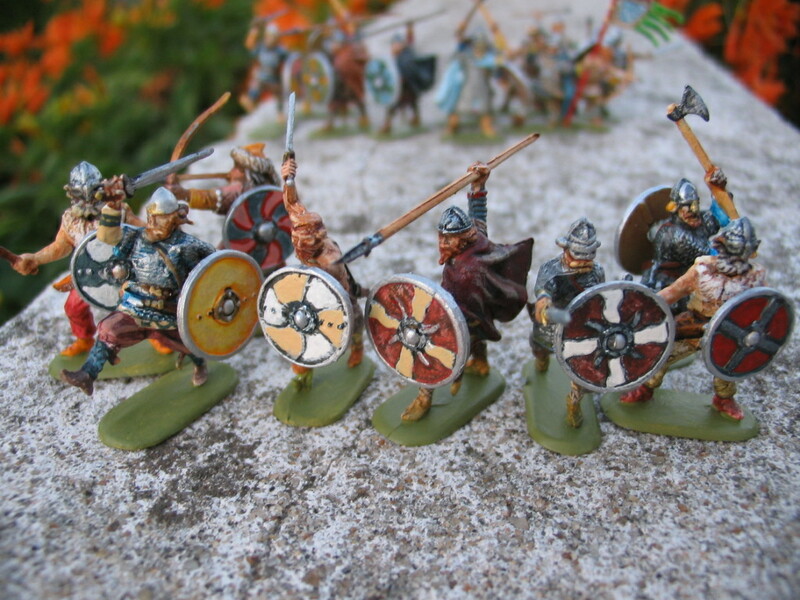 There is many Vikings made, but none so useful to wargamers as this one. 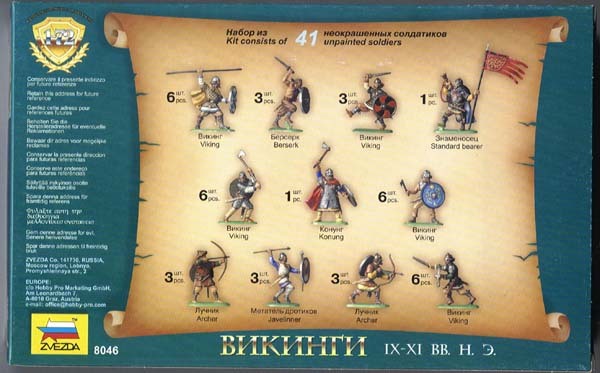 The leader, the standard-bearer/musician, the skirmisher and archers, etc. "The price value ratio of this soldiers will vary between every shop you go, and the best I can do is judge by their average price on eBay"
Not everything could be perfect in this set. The cheapest is about 8-9 GBP, and it can be more on retail shops. The question is that you are only given 41 figures, which seems a bit few, to make way for the shields that are made separate. Zvezda plastic is not too good to paint and glue, it will not be required glue if you don't to modify them, but painting them can be a bit tricky. When they were released, there were existing already 4 sets of Vikings (Emhar, Orion, and Strelets have made two), of which I already owned two, I don't like having more than one set of every faction, nevertheless , I did buy this set making it my third pack of Vikings. 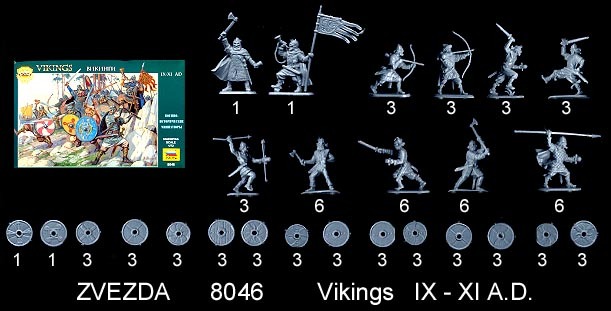 Is this the best set of Vikings? many would say yes, but my heart is still with my first set, the Strelets Vikings against Franks, but this is a very personal opinion. If you are a wargamer, this is your set. 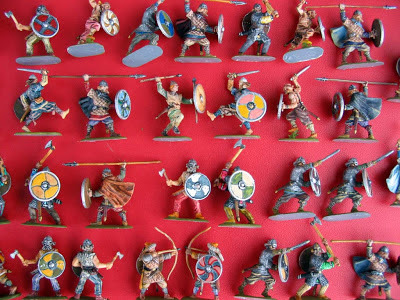 If you want epic and diorama usefulness, maybe the Strelets Vikings against Franks is better. I strongly recommend getting this set, even if you already have some of the previous sets. They are very nicely made, and although can be a bit expensive they represent very well a Viking army. In my opinion, the Orion and Emhar sets seem to be very early Vikings, nearly more Angles than vikings in the Emhar one, and the sculpting of all the 4 previous sets are inferior in quality. Thanks to Miniaturas Aconcagua, I can show you this great way of painting them!